Why we need to move from “the social entrepreneur” to social impact. Step aside, Superman, there’s a new kind of superhero in town. 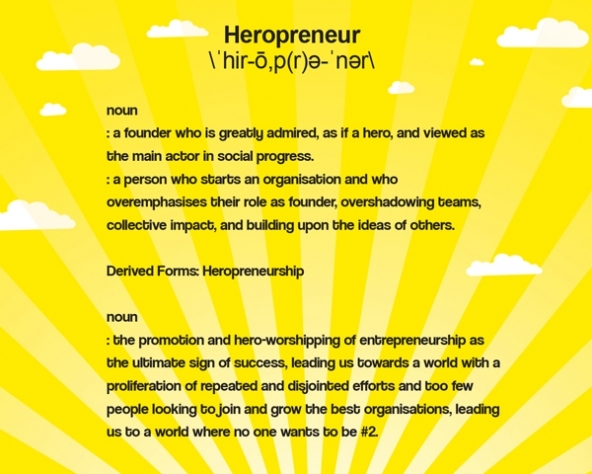 We’ve entered an era of heropreneurship, where reverence for the heroic social entrepreneur has led countless people to pursue a career path that promises opportunities to save the world, gain social status, and earn money, all at the same time. In business schools across North America and Europe, the longest waiting lists—once reserved for investment banking interviews—are now shared by entrepreneurship training courses and social impact events. The coffers of social collateral have shifted, and starting a social business is at the top of the Type A student’s to-do list. I’ve watched this shift first hand, first as an MBA student, and now through working in a business school and speaking with students at universities around the world. I’ve witnessed a significant increase in the number of students listing their career ambitions as “being a social entrepreneur,” a growing stream of new social entrepreneurship training courses, and increasing numbers of students graduating and jumping straight into launching a social venture. As I’ve watched more and more students focus their ventures on problems they haven’t lived, such as building an app for African farmers when the founding team has neither farmed nor been to Africa, my worries have grown about the way we teach, fund, and celebrate social entrepreneurship. I wondered whether others had the same conflicting feelings as me: excitement about the good intentions, but concern about how they were manifesting. So I decided to do some research. I conducted more than 40 interviews with educators, funders, and entrepreneurs, and had dozens of conversations with students. Many noted that the term “social entrepreneur,” which began to gain popularity more than 20 years ago, used to refer to people who had first-hand experience with a problem and went on to work on solving it. These people shifted how systems worked through collaborative cross-sector efforts, and though generating income was part of their work, their efforts and influence far outreached the size of their businesses. Many educators and funders share my concern that the focus now is on a distilled and mass-produced version of the promise of the social entrepreneur. In this “everyone an entrepreneur” era, hack-a-thons, accelerators, business incubators, and social entrepreneurship training courses are around every corner. They mostly focus on training people with the skills they need to start a social business, neglecting the many other skills required to fully understand a problem and fuel social change. To really change a system, I believe people need a more holistic set of skills, including systems thinking, an understanding of collaboration tools to further collective impact, and lateral leadership skills such as the ability to lead without power and to galvanize movement toward a common goal across a diverse and disjointed solutions ecosystem. They also need a grounded understanding of themselves and their skills, such as how they like to work, which roles in a team best fit their skills, and if/how their risk tolerance fits with the range of social impact career options. Finally, if they plan to take a leadership or strategic role in solving a problem, they need a deep understanding of the reality of that problem. Unfortunately, all too often, the people who get the funding to try their hand at solving global challenges haven’t lived those problems themselves. This comes from a range of biases. Donors, for example, often fund people they can relate to, and as the Dunning-Krugar effect explains, we often think the problems we know less about are easier to solve. The obsession with becoming “a founder” also arises from a lack of diverse educational funding programs. For example, most universities offer competitions or funding to help students start a venture, but don’t have contests and tools to support them in learning about and then “apprenticing with” the problems they care about. We—the educators, social entrepreneurship training program designers, social impact funders, and university professors who give money and accolades to students to go out and solve problems before we’ve given them the tools to understand those problems—are largely to blame for this phenomenon. We’re wasting limited resources on shallow solutions to complex problems, and telling our students it’s OK to go out and use someone else’s time and backyard as a learning ground, without first requiring that they earn the right to take leadership on solving a problem they don’t yet understand. We need to provide funding for learning, not just solving. A good example of this is the “Apprenticing with a Problem” funding (inspired by Peery Foundation Executive Director Jessamyn Shams-Lau, who first introduced me to the term) that I helped launch at the Skoll Centre at Oxford’s Saïd Business School. Only applicant teams that have lived the problem they are trying to solve or can prove that they have “apprenticed with” it can apply for funds to start-up a venture. But others can now apply for funds to go out and learn more about the issue they care about—to support an internship with a social impact organization in a similar challenge or geography, for instance.We also need to create more incentives and tools for students to learn about problems and to identify a range of ways they might contribute to solutions—beyond their business ideas. Our ecosystem mapping competition at Oxford’s Saïd Business School, for example, aims to reward students for their understanding of problems they care about, and I have developed an Impact Gaps Canvas, which others can build on, to help students think through the solutions mapping process. We need to celebrate a range of social impact roles. Many students believe that entrepreneurs are at the top of the impact careers hierarchy, but this isn’t the case. We also need people to join and help grow those start-ups, as well as people to take roles in more traditional businesses, governments, and organizations to help transform them from the inside. Educators need to highlight a range of high-impact career options and role models, spread out the accolades, and help students identify a range of roles where they can help replicate, connect, and redesign broken systems.To do this, we launched a Social Impact Careers Conference at Oxford; are planning an Alumni Award; and are bringing in a wider range of role models to inspire our students to apprentice with the problems they care about. For example, the unique journey of people like Avani Patel—who apprenticed with education problems, first as a teacher and later as a school administrator, before taking a role managing philanthropic educational investments—serves to inspire others seeking ways to contribute to the social change. We need to ask collaboration and learning questions. If we want to create solutions to global challenges that are grounded in a deep understanding of those problems and primed to fuel collaboration and collective impact, then we need to fund only the ones that are primed to do that! But many funding applications and accelerator programs ask more questions about business competition than collaboration. What if every social impact funder asked start-up applicants this: “What five organizations working in the same sector, within the same geography, or with the same demographic have you spoken with, and how have you built on the lessons you learned from their successes and failures?” If we encourage and celebrate “building on,” we will hopefully end up with fewer innovations designed in a vacuum, and applicants will feel less pressure to prove they are unique and more pressure to prove they’ve learned about the problem and current solutions landscape before building their business solution. As with any other systemic problem, tackling heropreneurship will need to be a collective effort. How do you think we can better channel good intentions into collective positive impact?